HRC is proud to join #ReconstruyeQ, a coalition of LGBTQ and allied organizations working to support ongoing rebuilding efforts for LGBTQ people in Puerto Rico who are still suffering from the effects of Hurricane María, which devastated the island last September. 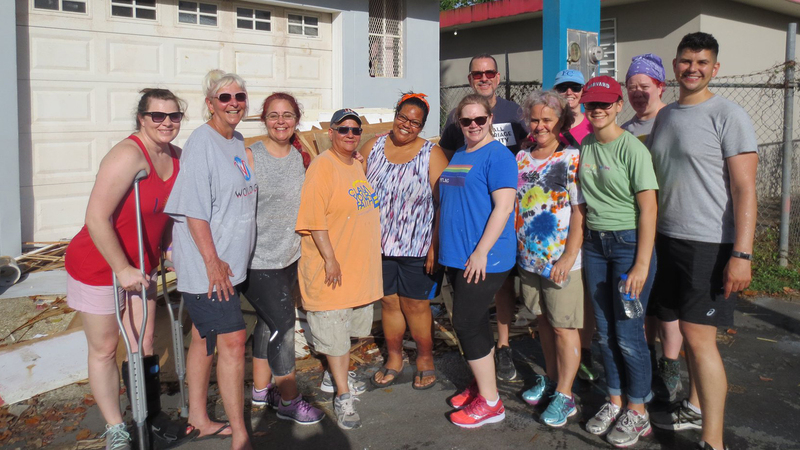 From May 13 to June 3, volunteers from organizations across the U.S. are traveling to the island where they will work with Waves Ahead, an organization based out of San Juan. They will be rebuilding homes for LGBTQ families in five cities before hurricane season resumes in June. “It’s an honor and a privilege to help my fellow LGBTQ Boricuas regain dignity and shelter -- and to be able to offer hands-on support to the rebuilding work with the support of HRC,” said Lisbeth Melendez Rivera, HRC Director of Faith Outreach and Training. Melendez Rivera is from Caguas, a city south of San Juan. Back-to-back hurricanes last fall caused catastrophic damage to homes and structures across the island, leaving most without power, communications capability or clean water. The death toll from the storm and its aftermath is estimated to be in the thousands, though it is likely that the full impact of the storms on the health and well-being of Puertorriqueños will never be known. While progress has been made in providing critical services to rebuild lives and businesses, offering healthcare and connecting the LGBTQ community in the eight months since the storm, advocates on the ground say that there remains a lack of adequate resources and visibility to address the unique needs of LGBTQ people. Over Memorial Day weekend, HRC was in Candelero Arriba, a neighborhood in Humacao, working on Ricky's house. Ricky's whole family has been living in two rooms since the hurricane, which tore off the second floor of their house. More than eight months later, and Humacao is still largely without power. This week, HRC helped rebuild the home of Nati -- a local gay elder in the neighborhood whose home was also destroyed by Maria. Although his entire family owns houses throughout the area, because Federal Emergency Management Agency (FEMA) only recognizes the title holder when giving aid, he has nothing to use to rebuild his home. HRC staff and volunteers were on hand to help install a new roof, windows and provide a fresh coat of paint to Nati's home. On May 30, HRC Director of Faith Outreach and Training Lisbeth Melendez Rivera showed "Before God: We Are All Family" and led a discussion about the film's themes of love and reconciliation with family and faith for LGBTQ people at a church in Levittown, Puerto Rico. On May 31, the neighborhood threw us a thank you party for all the work the project has done for their community. The vice mayor of Humacao spoke and presented the project leaders with certificates. Since this project began, HRC helped worked on three homes in the neighborhood: Waleska, Ricky and Nati. Waleska is a single mother and a leader and ally in the community. She had to move all her things into the second stall of her garage after the hurricane. She has an outside kitchen set up in the garage now too. HRC staff and volunteers helped paint and clean the upstairs of the house for her family to use again. Ricky is a gay man who owns a salon that provided most of the income for his family. Since the hurricane nine of his family members, including his mother, bedridden father and several aunts, were living in two rooms. The second floor of their house was taken by the storm. Our hearts remain with Puerto Rico as it prepares to face hurricane season, with so many still suffering from the effects of Hurricane María. HRC is proud to support this coalition and its vital, life-saving work for LGBTQ people in Puerto Rico.